Bathing toddler can be a fun and easy process. It is important to keep your toddler clean and healthy. Bathing is a critical part of this. There are some toddlers who do not like to take a bath. The good news is that it may change during this toddler stage and they could begin to like bath time. Until that time comes the name of the game is to use distractions. Below is a list of some distractions you can try to make bath time fun for your toddler and easier for you. This is a given. What toddler doesn’t like bubbles? Use their baby body wash as the bubble bath. Never use regular bubble bath or shampoo. It may hurt their little eyes or skin. Only use the same stuff you wash their little bodies with. Just a little bit of bubbles makes all the difference. It keeps them laughing and distracted. Any kind of bath toys are FUN when bathing toddler. Especially the ones that fill with water and squirt the water back out. My son would get so tickled when I squirted the water back at him. You can buy toys and keep them specifically for “Tubby Time”. Boats and duckies are a classic and still a hit with any child. It is so funny because my son is 3 now and at bath time he has more toys in the tub than water. (This is just a figure of speech LOL). You see my point he has grown to love his toys in the bath tub with him. It makes it fun for them and especially if your toddler is uncomfortable taking a bath. These are really great, but we do not use them every day. They are fun but sometimes can get a little messy. You can designate a day of the week for chalk and paint. It is fun for them to draw on the sides of the tub or shower walls. Are we ready to discuss the tips and precautions that our family uses for bathing toddler? As they become older they can get messier especially after they eat. It is so important to keep them healthy and clean. So let’s get Started!! VERY VERY Important!! I can’t stress this enough. Always test the water before you place your toddler in the tub. Use warm water. It should not feel hot to you. 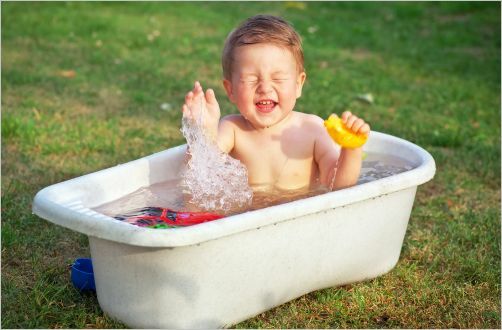 Remember when bathing toddler you cannot bathe your child in the same temperature of water you may use. It can burn them. Children are sensitive to hot water. My son likes the tub water to be on the cold side. So use caution and be careful when selecting the right water temperature. There should only be a few inches of water in the tub. That is all that is needed. Toddlers can potentially drown in a small amount of water so be careful and judge appropriately. Use baby wash for their body and hair. My toddler is 3 and I still use baby wash on him. It’s great because it doesn’t hurt his eyes and it washes his hair at the same time. This way you only need to buy one product instead of two. The adult bath soap also tends to dry out their skin so just stick with the baby wash. Plus you can use the same baby wash for BUBBLES in the tubby. You see baby wash is the best and has so many great uses!! My son is 3 and I still use the baby wash cloths. I love them. They are thinner and great to use. I always use two wash cloths when bathing toddler. One I use to wash his hands face and body. The other I use to wash his bottom and private areas. This is a personal choice just remember if you only use one washcloth than wash their face first and their bottom last. *Special Tip* I also use a nail brush when I bathe my toddler. Toddler care is important! Dirt can collect under their fingernails and this is great to wash all of those germs out of there. Cleanliness and sickness go hand in hand so keeping fingernails clean is important. The towels with the hoods on them are great!! You can wrap them up after their done and their whole body is covered. Then you can dry them off well and they are ready to go!! I have purchased lots of these towels and they are Nice! You can also purchase some great toddler bath robes as well. NEVER leave your toddler unattended in the bath tub not even for a second. Anything can happen and they can drown. If you must, take the phone in the bathroom with you. Your toddler’s safety is more important than leaving the bathroom to go answer the phone. Never let your toddler stand up in the tub. They can slip and fall and get severely injured. You do not want this. Again use the distractions listed above to keep them busy and sitting down while you are washing them up. The spout covers are fantastic!! They will cover the spout and the hot and cold water. This way in case your toddler hits their head on the spout it is covered and they are less likely to get injured. Also with the hot and cold water knobs they will not be able to turn the water on by accident. Prevention is the key. Make sure you have a kid friendly bathmat in the bottom of the tub also to keep them from slipping. I hope all of this information helps. We have to bathe our children every day. 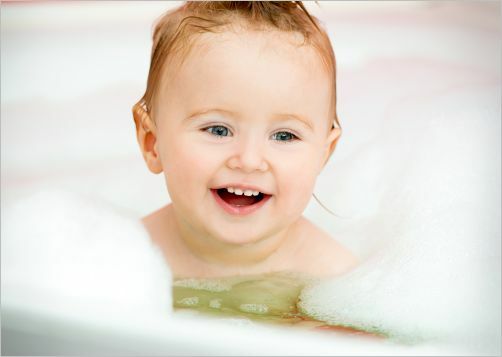 It is important to settle into your own personal routine when it comes to bathing toddler. Make it FUN for them. Pretty soon they won’t need you and will be showering on their own.